Gu Kailai, who formerly had a high-flying career as a lawyer, is currently being detained by central government authorities on suspicion of murdering Neil Heywood, a Briton allegedly in Gu’s “inner circle” whose body was cremated without an autopsy after being discovered in a Chongqing hotel room last November. Her husband Bo Xilai, a flamboyant politician once tipped to rise to the highest echelon of power, has also been detained for “serious discipline violations” rumored to include corruption involving hundreds of millions of dollars. Gu Kailai’s arrest over Neil Heywood’s death has sparked widespread speculation that the two may have been romantically involved. Neil Heywood had known the Bo family since the 1990s, when Bo Xilai was the major of the northeastern Chinese of Dalian, and was said to have looked after the couple’s son, Bo Guagua, who has been studying in the UK and US since the age of 12. 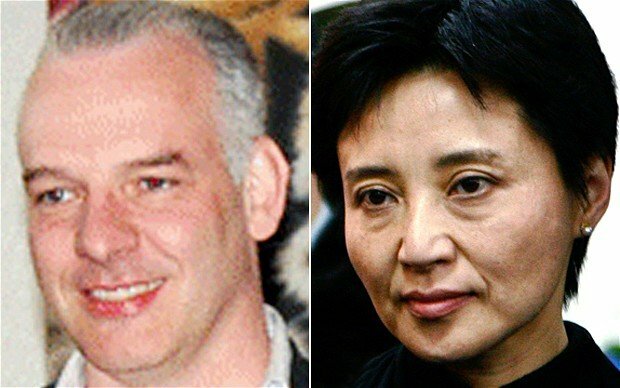 Gu Kailai also reportedly introduced Neil Heywood to his Chinese-born wife, Wang Lulu, who recently visited the British embassy amid claims that she was planning to escape the country with her two children by Neil Heywood. Now two separate sources have told UK newspaper the Times that they believe Gu Kailai and Neil Heywood’s relationship went beyond mere friendship. Wang Kang, a Chongqing academic with contacts linked to Bo Xilai, said there was a “definite” romantic relationship between Gu Kailai and Neil Heywood, which began when Gu came under pressure from Bo to set aside her legal career to make way for his political ambitions. “Of course they liked to look like a perfect family but there were no true feelings between them,” Wang Kang said. The other source, who refused to be named, claimed he was “linked” to the property at which Gu Kailai and her son stayed when they first arrived in the UK in 2001, and had seen Gu and Neil Heywood acting like “an item.” Documents showed that between March 2001 and January 2002, Gu Kailai and her son had stayed at the top floor of Keystone House apartment in Bournemouth, a seaside town in southwest England. Bo Xilai did not accompany them as he remained in China to focus on his political career. According to the source, Neil Heywood was a regular visitor at the apartment and had been seen leaving with Bo Guagua in the mornings. While Neil Heywood was only one of three English businessmen who frequented the apartment, he was the only one assumed by the source to have been intimate with Gu Kailai. “Body language,” the source explained. Regardless of whether the allegations of an affair are true, it does appear that Gu Kailai and Neil Heywood’s relationship had clearly soured prior to the Briton’s death. The source also corroborated earlier claims that Gu Kailai was convinced that someone in her inner circle had betrayed her and had demanded Neil Heywood divorce his wife and pledge allegiance to her. However, the source could not confirm rumors that Neil Heywood may have been killed after threatening to expose Gu Kailai’s plan to move millions of potentially dirty money abroad, saying that he had always been “very cagey” about exactly what he was doing for the Bo family. While there has been speculation that Gu Kailai may have taken the fall over Neil Heywood’s murder in order to protect her husband, Chinese-language magazine Yazhou Zhoukan has reported that sources claiming to know Gu Kailai personally have said they are not surprised by her arrest. The magazine painted Gu Kailai as a strong personality who was so stubborn that even her husband usually had to yield to her. Sources told the magazine that Bo Xilai had hastily left a session of the National People’s Congress on March 9 because he had received a phone call from his wife, who urged him to defend her and their son from the corruption claims that were about to be unveiled. This is why, the sources claimed, Bo Xilai had staunchly defended his family when the allegations were first made public. There have also been reports that two days after Neil Heywood’s death, Gu Kailai met with Neil Heywood’s widow Wang Lulu at a Chongqing coffee shop, where she tearfully pleaded with Wang to accept the official explanation of “excessive alcohol consumption” and not order an autopsy on her dead husband. Wang Lulu allegedly accepted the request and Heywood’s body was cremated a day later. While the world waits for the official results of the investigation into Neil Heywood’s murder, the Chinese government has been keen to shoot down rumors that the Briton’s death is being used as an excuse to bring down the flamboyant and highly popular BoXilai to ensure a smooth leadership transition from Hu Jintao to Xi Jinping at the party’s upcoming 18th National Congress.